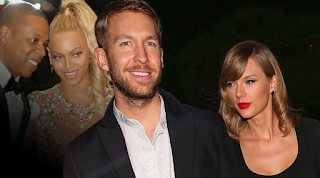 Taylor Swift and Calvin Harris dethrone Beyonce and Jay Z as Forbes Higest-Paid Couple. No biggie. Taylor Swift and Calvin Harris have been crowned by Forbes as 2015’s Highest-Paid Couple, kicking Beyonce and Jay Z out of the No. 1 spot on the list of the world’s highest-paid celebrity couples. Swift and Harris (Tayvin, for us dedicated fans) cashed in a cool $146 million in the last year, dethroning Bey and Jay, who secured the second spot with $110.5 million. The “Shake It Off” singer’s 1989 album was the best-selling album of 2014, while the “Summer” producer casually holds the title of the world’s highest-paid DJ. Swift also has endorsements including Diet Coke, Keds, and Sony, while Harris’ abs have been showcased in a campaign for Giorgio Armani’s line of underwear. Coming in third on the short list of three is country’s favorite couple, Blake Shelton and Miranda Lambert. The Academy of County Music awards Female Vocalist of the Year winner and Voice coach brought in $57 million this past year. They aren't married...WTF would someone would compare "fire crouch" Taylor Swift to a VERY married JayZ and Beyonce. And I am not even a Bey-Jay fan.....smh! Taylor swift and Calvin have been dating for like a month... All of the money they made last year, they weren't even together so how could they be considered the richest power couple of 2014 when they weren't together in 2014? Bey and Jay aren't LEGALLY married either!